You can deploy FortiGate-VM using Terraform. In this example, OCI is a Terraform provider, and FortiGate is a Terraform consumer. For details about Terraform, see Introduction to Terraform. 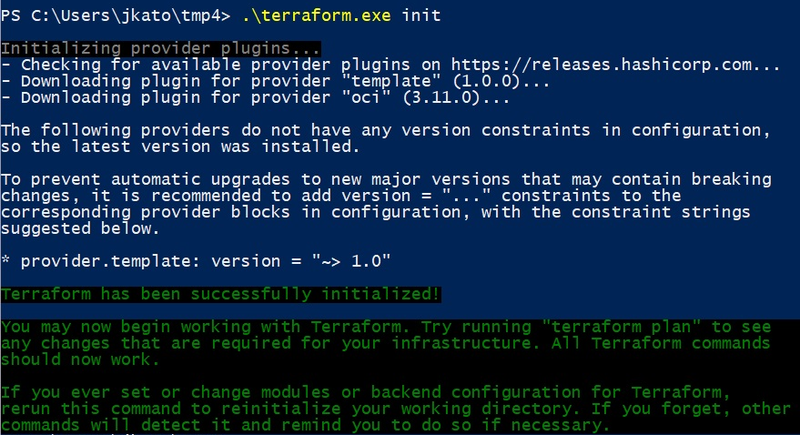 See Getting Started with the Terraform Provider. Prepare a PEM key file for the user to authenticate themselves with the OCI platform. Upload the FortiGate-VM image to OCI where you plan to deploy the FortiGate-VM. For details, see Obtaining the Deployment Image File and Placing It in Your Bucket. Prepare Terraform deployment files. There is a sample set of Terraform files available on GitHub. Clone or download the files in the Single-VM-BareMinimum-BYOL directory. This creates a new VCN. Select your OS with the Terraform applications. See Terraform Downloads. Change the OCI variables in the terraform.tfvars file. You must know the OCIDs of your tenant, compartment, user, and region. If using Windowes, you do not need to specify the C: drive in paths. Security list settings. Ensure you open port 443 to allow access to the FortiGate-VM. Disk size for the second drive. By default, this is 50 GB. Run terraform.exe init to initialize the Terraform environment. Check the output for newly creating resources. You can add "-out" and an output file to check the output in the file. At the Enter a value prompt, enter yes to continue. Wait about ten minutes for the command to end. In the OCI console, navigate to the newly created resources. The FortiGate-VM instances and VCN have been created. Connect to the FortiGate-VMs. See Accessing the FortiGate.